A calmer weather pattern looks to set in for the end of the week into the weekend here in Bowling Green. The biggest story will be the cooler temperatures with several mornings starting out below freezing. Conditions should remain dry Thursday into the weekend as our air remains very dry with dew points only in the 30’s throughout most of the period as winds remain out of the north advecting in dry cool air from Canada. Surface high pressure will dominate the forecast period. 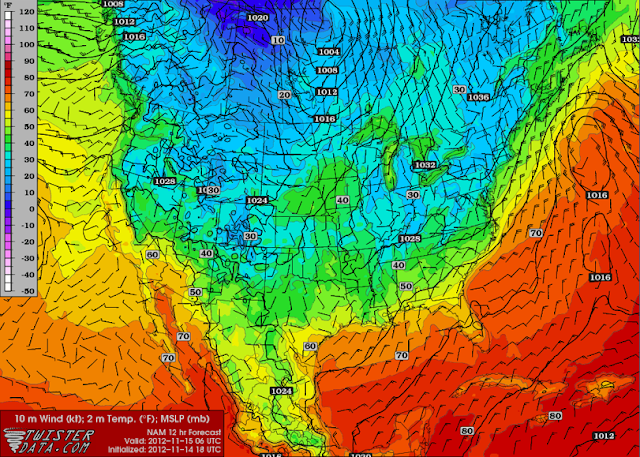 NAM Forecast surface temperature for Thursday morning. 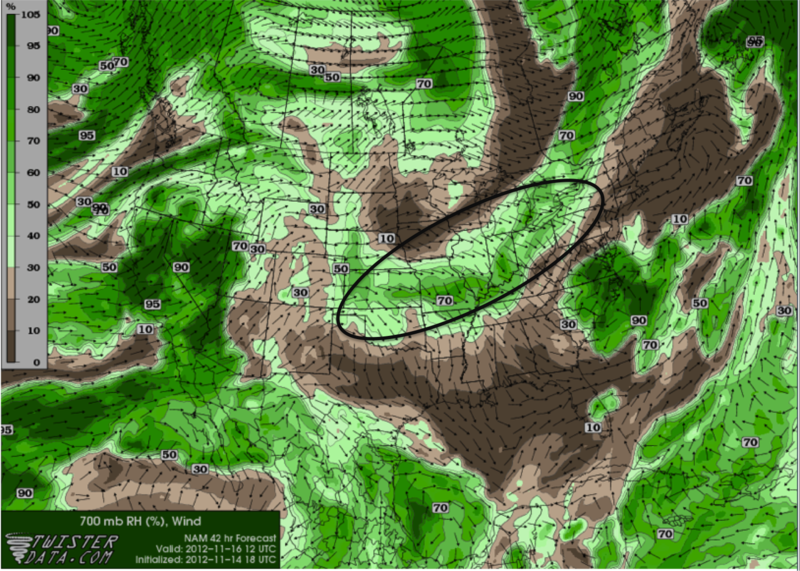 Some weak upper air disturbances in the form of shortwave troughs will move through Thursday into Friday. With moisture lacking, it is not likely that we will see showers. Thursday looks to be mostly clear and sunny. Cloud cover will likely increase into Friday with relative humidity forecast to be around 60% during the day. Saturday and Sunday we should see more clear sunny conditions. NAM forecast relative humidity for Friday 7 am. Circle shows relative humidity values around 60-70% beginning to move into Bowling Green resulting in increased cloud cover. Thursday: Low, 28. High, 52. Mostly clear with morning temperatures below freezing. Friday: Low, 32. High, 54. Clouds increasing in the morning with periods of clearing throughout the day. Morning temperature below freezing. Saturday: Low, 34. High, 55. Warming up with clear skies. Sunday: Low, 40. High, 55. Mostly clear skies.